Lilly (Left) and Dexter’s owner called me to help with multiple issues; over-barking, jumping up, chewing inappropriate objects and not responding to their owner’s corrections. Their owner had told me that Lilly was a model dog before the arrival of Dexter, a seven-month-old Australian Shepherd / English Spaniel mix. 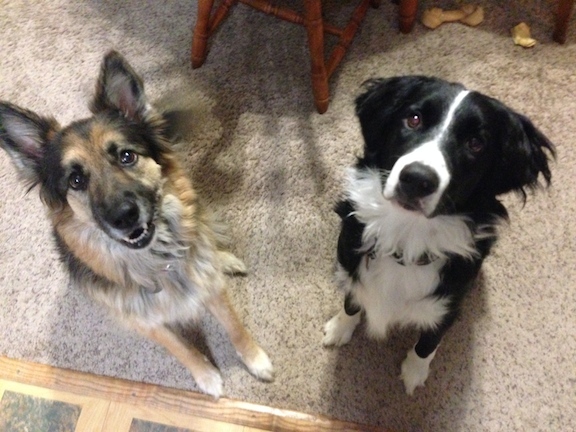 Its not unusual for a dog’s behaviors to change with the addition of a new dog to their home. And when that new dog is a puppy with multiple behavior issues, its not uncommon for some regression by the adult. Its not so much giving up, its more a case of the adult adopting a different behavior to counter or communicate with another dog. This is most frequently the case with homes that have little to no rules and structure. It took all of 60 seconds to tell that that was absolutely the case in this home. The dogs showed zero respect for their owner’s personal space; jumping up on them, rubbing against them (to mark the person with the dog’s scent), digging or nosing their owner’s hands for attention, etc. To disagree with the demand for attention and violation of their personal space, I had them hiss at the dog the second they got too close or initiated unwanted contact. I prefer to use a hissing sound to disagree with actions and behaviors I do not condone. I use this sound for two reasons. The first it so the dogs know that the communication is directed at them specifically. The send is that mother nature has instilled in all dogs the recognition of a hiss as a warning. By using a sound the dog’s already have an appreciation for, its almost always instantly recognized and respected. While the hiss worked for a second, both dogs were anxious for their owner’s attention and resumed pawing and jumping up on them. To amp things up, I had their owner’s stand up and turn so they were facing the dog, each time the dog got too close. To a dog, standing up says you mean business. Each time that their owners stood up, the dogs instantly stopped and backed away from them. But just like the hiss, the solution was only temporary. As soon as the owners sat down, the dogs came back and started invading their space again. To take things to the next level I had the owner’s stand up, turn to face the dog, then march directly at the dog until it sat down or turned away. Once we adopted this new technique Lilly stopped her barking and started to respect a one foot distance or walked away and laid down. However her roommate Dexter was undeterred and returned to jump up on them over and over. To help Dexter understand the behavior was unwanted, I added a final consequence; placing him on a leash and standing on it with about 24 inches of slack. At first he pulled and tried to twist his way free but once he realized that tactic wasn’t working, he sat down. As soon as he did I pushed the foot standing on the leash closer to him to take off the tension. A minute later he laid down and his energy level dropped as well. A minute later I took my foot off the leash discretely so Dexter wouldn’t notice. He continued to lay there and continued to relax. I suggested that they apply these same series of escalating consequences every time the dogs demanded attention, engaged in unwanted behaviors or got too excited. This will be extremely important for Dexter who had more energy than Lilly. Because both are higher energy level dogs and the family has a young toddler, I suggested that they find a local dog walker to help burn off the unused energy that was assuredly a big part of the problem. Dogs, especially younger dogs and puppies have an abundance of energy and if its not released thoroughly, that excess energy will roll over into other areas. By adding a structured walk to their daily routine, the dogs should be much easier to work with in the home. We finished up the session by going over some changes to the feeding routine. Their owners had been feeding the dogs in separate rooms. By feeding the dogs in the same room in a structured way (humans eating first while the dogs wait with food in their bowls), their owners can take on more of a leadership appearance to both dogs. Clearly the unspent energy is the biggest immediate problem for Lilly and Dexter. But once that issue is addressed with daily 30 – 45 minute walks, the new rules boundaries and structure will help the dogs start to see and identify themselves as having less authority than their owners. Once this new leadership dynamic is in place, many of the unwanted behaviors will stop on their own. And for those unwanted behaviors that continue, the new communication methods will allow their owners to put an end to them as well.